“Slick Water”, of course, is the feel of good water when changed by Fracking poisons. It is good water invaded by (Corporation-imposed secret) human-and-plant-destroying poisons pumped underground during “Fracking” (hydraulic fracturing of natural underground strata) to “retrieve” oil and/or natural gas. Those poisons then find their way into the agricultural and drinking water of unsuspecting people who reside (usually) not far from the work of those giant, care less, private Corporations which – all too often – have bought-and-paid-for government regulators and politicians in power. The poisons … then make ill, maim, and even kill plants, animals, and human beings. The enormity of the damage to land and water and creatures, the outrageous invasion of the sanctity of innocent people, and the permanent tragedies created could only be possible in a world where Big Corporations have become, in fact, law-makers and enforcers in a world where corporate crime is accepted as normal behaviour. 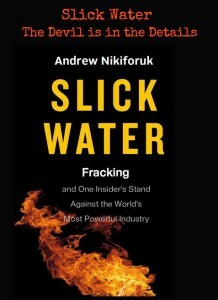 Slick Water is, too, the name of the latest book (on the above subject) written by excellent writer, Andrew Nikiforuk. He was one of the first to tear the Angel Wings from the Tar Sands operations in a book of that name in 2008: Tar Sands, Dirty Oil and the Future of a Continent. Readers of this review could do no better as a beginning of their read through winter-books than to read Slick Water, centering on Canada’s Fracking Fighter extraordinaire, Jessica Ernst of Rosebud, Alberta. The book links her, appropriately, to the long, horrific historical tale of Hydraulic Fracturing which she has been one of the most indomitable in bringing to Canadian (and global) public attention. The beauty of Nikiforuk’s book is that it brings the marvellous Jessica Ernst to life for readers to come to know … at the same time as it illuminates the slow (150 year) development of a “greed process”, Fracking, begun (of course) in the U.S.A., and spread to … wherever on the globe greed can elbow its way in and gas or oil can be – earth-shatteringly and poisonously – forced to the surface. Some enlightened countries outlaw Fracking completely. Readers will find in this book a hundred aspects of the Slick Water story that catch and hold their attention. A commanding aspect, linking widely disparate events and occasions, is caught in one of the most sparkling (if it may be called that) chapters entitled “The Police Come Calling”. 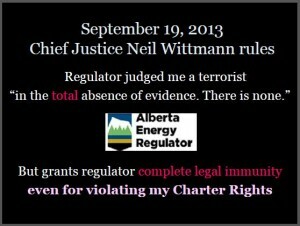 In the face of allegations of Encana Corporation violations of the law, Alberta regulator violations of the law, Alberta lawyers rejecting their obligation and refusing to represent Jessica Ernst, and shameless misreporting by the Alberta Research Council … and, I add, an Alberta government pretending to know nothing about anything relevant – a strange event occurred. Calling themselves members of the National Security Enforcement Team (? ), RCMP officers first called Jessica Ernst by telephone and were told by her not to visit her property. Days later, they arrived at her home unannounced and without any kind of Warrant. The visit – one may speculate – had a number of purposes. To frighten and coerce Jessica Ernst. To urge her into naming sympathizers. To please the federal government led by Stephen Harper, and to please the (then Eternal) Conservative government of Alberta, and the Encana Corporation, and the cowardly lawyers of Alberta who would have been pleased to see Ernst frightened away from legal action. Without intending to be controversial or extreme, I would say that the RCMP officers, Dennis De Franceschi and Dave Bibeau, who confronted Jessica Ernst would not be unique as examples of what I suggest may be called lawless uniformed officers supporting crime in Canada. One only has to raise one’s eyes to see extravagant examples. When the murder of Robert Dziekanski (2007) by RCMP officers occurred in Vancouver International Airport (the act was renamed for convenience), it was supported by all levels of the RCMP from the Vancouver offices to the desk in Ottawa of the national Commissioner of the RCMP. Then, a little later, the fraudulent misuse of RCMP investigations to “manage” the Mike Duffy case in favour of Stephen Harper and his close, wealthy ally Nigel Wright is there for all to see. By sleight-of-hand too despicable for words, the evidence was jimmied to claim Mike Duffy received a bribe of just over $90,000.00 handed to him as a signed cheque by Nigel Wright. But Nigel Wright did not pay a bribe, it is claimed. Before the entire population of Canada the RCMP went along with that complete sham. There is not the slightest doubt that Commissioner of the RCMP, Bob Paulson, signed off on the spectacular (and insulting to all Canadians) boondoggle. Let’s put it simply. 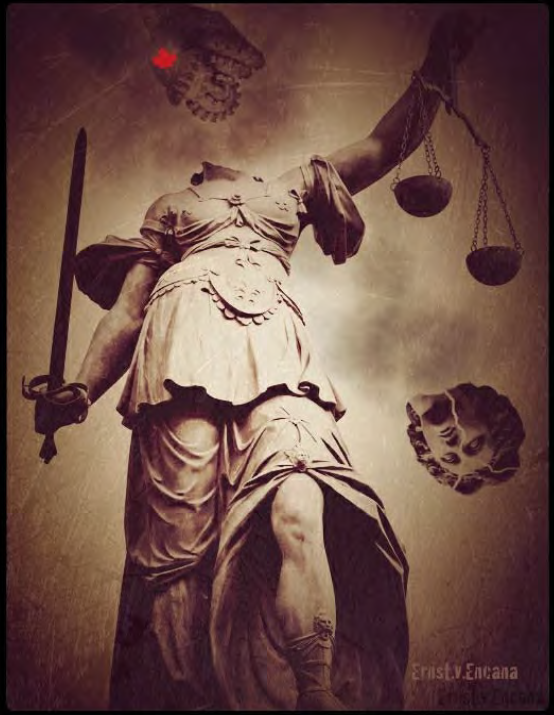 The whole, cruel torture – through the Fracking process – of Jessica Ernst and hundreds of others in Canada … and thousands around the world – is made possible by the sell-out to giant, largely private Corporations by police, lawyers, the law, the courts, and governments elected to serve and protect the people. To this day, the new People’s Government of Alberta [NDP] has not lifted a finger to lessen the injustice under which Jessica Ernst staggers. Indeed, the Alberta NDP government has approved the continuing role of Gerard Protti, former vp of Encana Corporation and former president of the Canadian Association of Petroleum Producers as top man at the Alberta Energy Regulator. Both Encana and the AER are named as delinquent in Jessica Ernst’s case. If the new government in Ottawa sees fit to take a harrower through the RCMP – a long overdue undertaking – it should do the same through the process of appointments to higher courts in all the provinces. Indeed, it needs to sit with provincial governments and work slowly and certainly to reconstruct higher court processes – which are opaque, needlessly bureaucratic, elitist, high-handed, grossly expensive, purposefully procrastinating, and systemically punitive to ordinary members of the population seeking remedy for injustices done to them. Ernst replies to him completely in character. Three things matter. One is groundwater. The second is the integrity of the democracy she lives in, and the third is breaking the cycle of abuse. What she does not say (and perhaps doesn’t know at that early date) is that the cycle of abuse by the poisoners of water, land, and health is only possible because of the corporation/lawyer/police/court/media participation in the cycle of abuse quietly smiled upon by corrupt governments. How to end that cycle and to restore the integrity of the democracy she lives in is … for all the rest of us to take on. Andrew Nikiforuk is – to my mind – very gentle in his treatment of the Alberta higher court in the case being fought by Jessica Ernst. Nevertheless, he hints at what I believe is a shameless intention in the Alberta Court of Queen’s Bench to delay the trial, to increase Jessica Ernst’s costs alarmingly, and to force her into bankruptcy. I will leave it to the reader to decide for herself or himself the role of the Alberta court in Jessica Ernst’s trial … and Andrew Nikiforuk’s assessment of it. Justice is in chains in the Jessica Ernst case against Encana Corporation for fouling her farm, her water, her life, her hopes for the future. Justice is in chains in Ernst’s attempts to have the “regulator” of Oil Patch behaviour judged for failing to do its job of “regulating” (throughout the province). 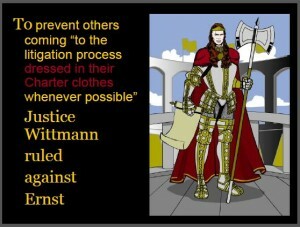 Justice is in chains in the Jessica Ernst case before the Alberta Court of Queen’s Bench (Alberta’s Supreme Court) because – among other (hugely important) things – the court is not insisting upon prompt responses from those complained against, not insisting upon prompt and clean submissions of evidentiary materials requested by the plaintiff. etc.,etc. The spotlight is upon Chief Justice Neil Wittmann who “volunteered” to take over the case when (surprise!) the judge on the case was suddenly promoted off it to the Appeals Court. 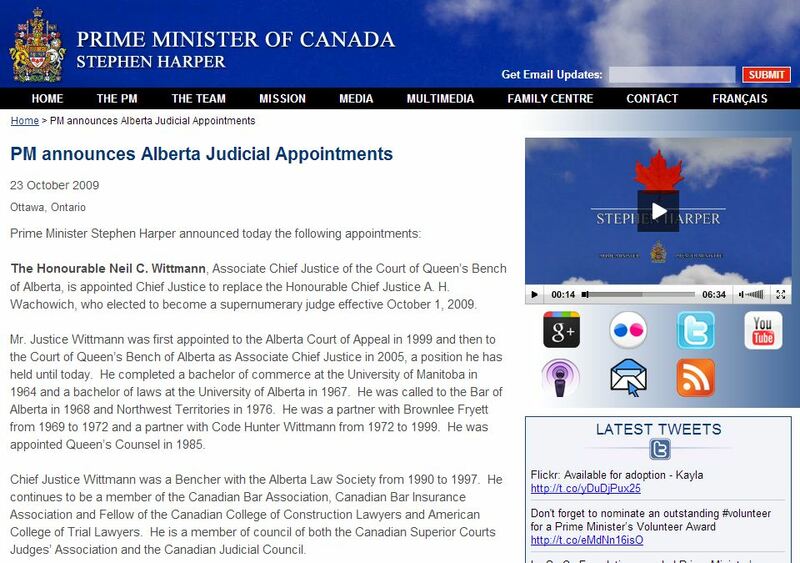 (Her promotion had to involve Stephen Harper’s cabinet and the senior operatives of the Alberta Court of Queen’s Bench… and who else?) The case is momentous – calling into question the activities of a huge private Oil Patch operator and the government of Alberta’s regulator. 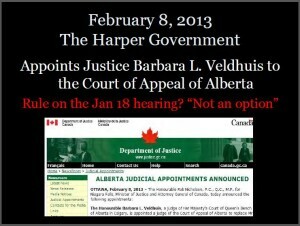 The action of Chief Justice Neil Wittmann to force a Supreme Court of Canada appeal about his ruling that the Alberta regulator is “beyond” the reach of the Charter of Rights and Freedoms in the Canadian Constitution is seen by some as a vexatious and obnoxious action to delay the trial – and cause Jessica Ernst enormously increased costs. If the Honourable Neil Wittmann’s action has been, in fact, a move to show sympathy for the bodies Jessica Ernst is acting against … then justice in Alberta is truly in chains. But Jessica Ernst has been a major person in forcing the unshackling of truth about “Fracking”. She has been major in forcing the unshackling of truth about the abuse of land and people by Big Oil and Gas in Alberta – and its “buy-off” techniques. She has been major in exposing the Alberta Regulator as a friend of the violators. She may well prove to be instrumental in unshackling a truth about large-scale corruption in the Court of Queen’s Bench, Alberta. Then the chains will begin to come off – even off the legal system in Canada.